The trip was planned in connection with the course’s final project. Each student was assigned a manuscript from the Biblioteca Ambrosiana to study, transcribe, translate, and analyze in a written commentary, using microfilms from the Ambrosiana collection of the Medieval Institute. Visiting Milan was the culmination of their research efforts, allowing them to study their manuscripts firsthand without the limitations that the microfilms imposed. 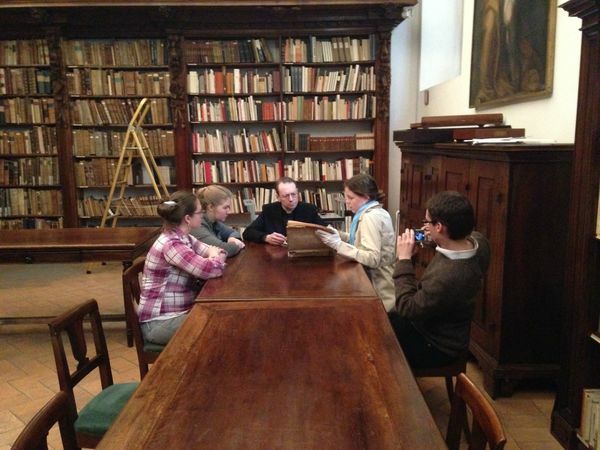 Reverend Canon Doctor Federico Gallo, director of the Biblioteca Ambrosiana and scholar of paleography, also offered a private seminar for students to talk about the library’s codices. In addition to examining manuscripts, the class spent time exploring the city. Don Federico Gallo gave a guided tour of his favorite churches, restaurants, and landmarks in the area, and the group explored on their own as well. The most interesting sights included the Duomo di Milan, the Castello, the University of Milan, and the Battistero, where St. Ambrose baptized St. Augustine. 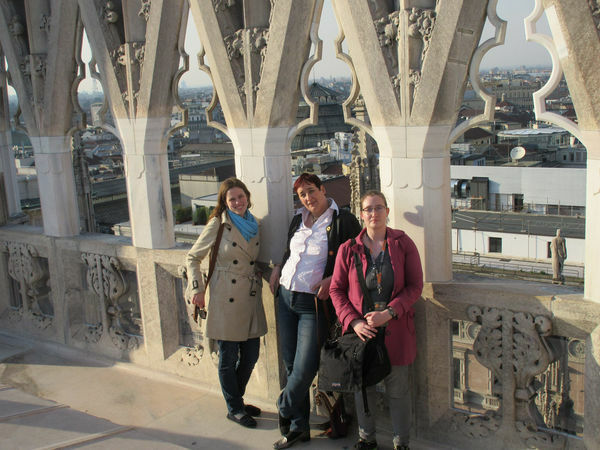 The trip was made possible through the Ambrosiana Grant in the Program of Italian Studies, the Nanovic Institute’s Teaching Beyond the Classroom Grant, the Department of Classics, the Medieval Institute and the Early Christian Studies Program. Non-Notre Dame scholars who wish to consult the Ambrosiana Microfilm Collection may apply for a stipend from the Medieval Institute. Originally published by Olivia May at classics.nd.edu on May 01, 2017. Modified by Brandon Cook on May 3, 2017.